Original. The Aleuts were in the far western part of Alaska and are part of my fascination with Native Americans. 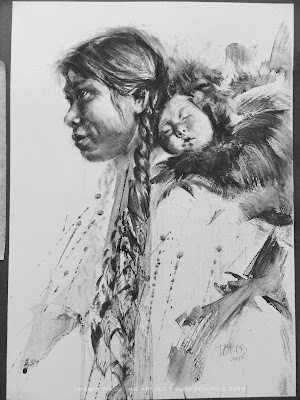 Infectious diseases dwindled their population to about 2,000 but their culture continues and number around 15,000.Buy Now and this charcoal wash painting will be shipped anywhere in continental U.S. or Canada or visit my Fine Arts Gallery & Studio in San Diego to save the $30 shipping fee. If you do not see what you need, be sure to contact us for a custom painting.